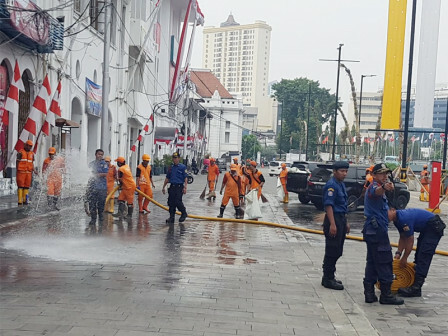 65 joint personnel consist of 40 PPSU personnel, 5 Water UPK Unit personnel, 10 Kota Tua Cleaning Unit personnel, and 10 Taman Sari Sub-district Sector Damkar personnel clean up Taman Apung (floating park), Kali Besar.
" Personnel are deployed to clean up the area from trash and cigarette butts"
Pinangsia Urban Village Head, Ilham Agustian Lesmana said, cleaning is done for preparation to hold Kali Besar Festival on August 30-September 1. "Personnel are deployed to clean up the area from trash and cigarette butts tucked between andesite stones. Including to arrange several plants in the area," he stated. Not only cleaning up trash, he continued, personnel will also clean andesite stones by doing carbolization along Kali Besar to eliminate unpleasant odor. "After this, we place several PPSU and Satpol PP personnel to watch and clean Kali Besar. They are divided in two work shifts, morning and late afternoon," he informed.